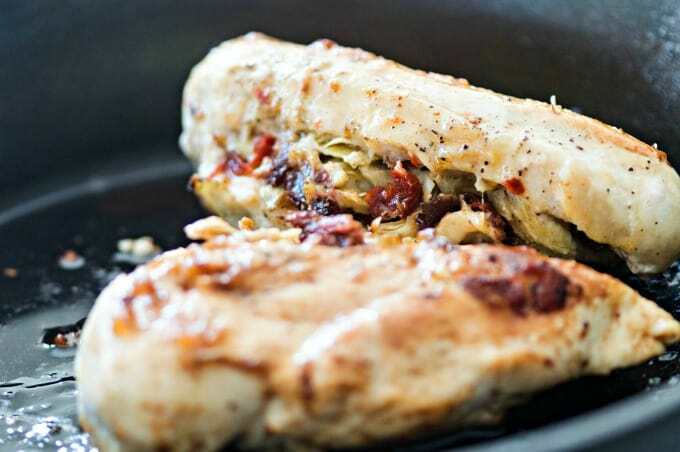 Mediterranean Stuffed Chicken Breasts Recipe: Easy yet elegant! 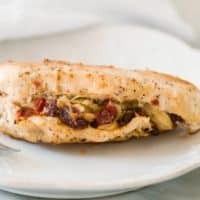 This Mediterranean Stuffed Chicken Breasts Recipe is one of my favorites to serve when we have company. 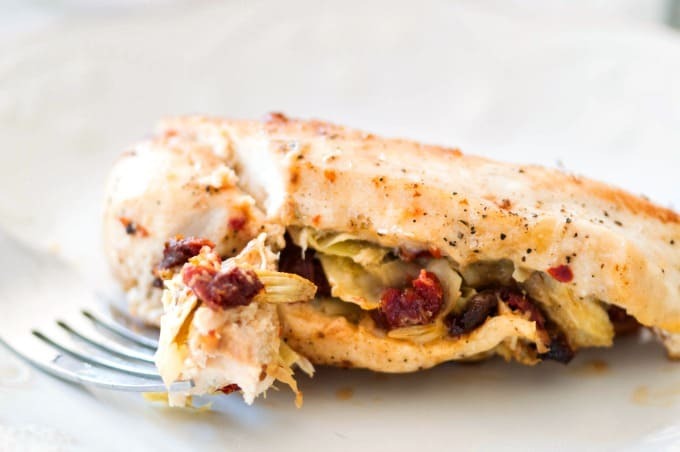 Although it’s easy to prepare, the combination of nutty Parmesan, tangy sun-dried tomatoes, and tender artichoke hearts in a perfectly cooked chicken breast is amazing. I don’t know about you, but I love a recipe that lets me get some of the steps out of the way well ahead of time. Sometimes, when I’m cooking for my family, I just want to avoid the whole homework/dinner rush. When we have company, I like recipes that give me a chance to fix myself (and the house) up before they arrive. 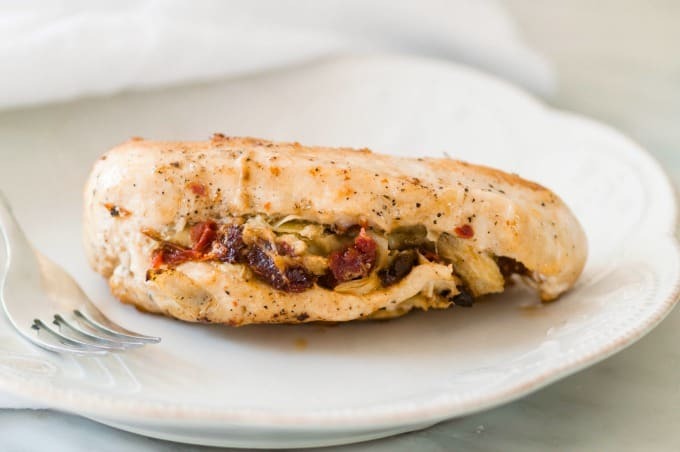 With this Mediterranean Stuffed Chicken Breasts recipe, you can stuff the chicken breasts then pop them into the fridge while you go about doing whatever you need to do. Just remember and take them out of the refrigerator before preheating the skillet and oven, so they’ve got a chance to reach room temperature. The stuffing is an effortless blend of freshly-grated Parmesan cheese, chopped sundried tomatoes, and marinated artichoke hearts. Since I’m a fan of homemade marinated artichoke hearts, I always have some on hand. My problem is nibbling at them while I’m getting the rest of the stuffing ingredients ready! 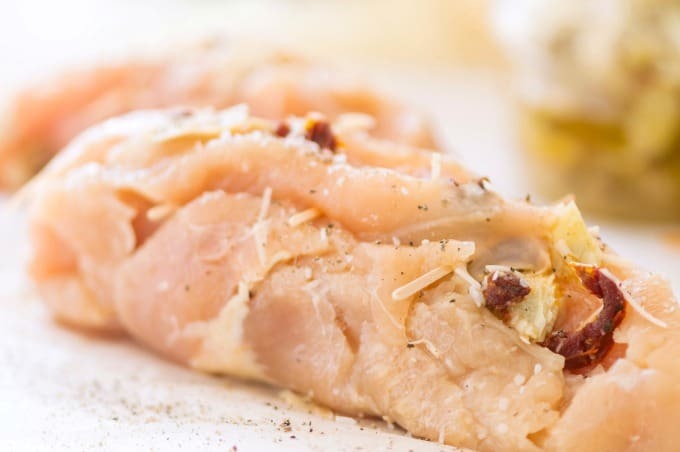 If you’ve never stuffed a chicken breast before, it’s not difficult. Just cut a shallow pocket about 1/4 inch deep in the thick side of the breast with the tip of a paring knife. Then, use your fingers to make the pocket bigger without pushing through to the other side. You want to end up with a pocket that’s around 2″ deep that runs the length of the chicken. Close the pocket with toothpicks, about 3 per chicken breast. It helps if you can slightly overlap the edges of the chicken before sliding the toothpick through. You want to make sure that seam is closed well, so you don’t lose the stuffing to the skillet in the next step. Transfer the skillet to the oven and bake the chicken for 20 minutes. Be sure to test the temperature and make sure the center reaches 165°F / 74°C. Remove the skillet from the oven and let the chicken rest for 5 minutes before you carefully take out the toothpicks. Served with rice pilaf or my Lemon Asparagus Orzo, these Mediterranean Stuffed Chicken Breasts are a meal to be proud of. In fact, I think I’ll put them on our menu again this week! This recipe first appeared on February 25, 2013. It has been revised and the photographs updated for republication. 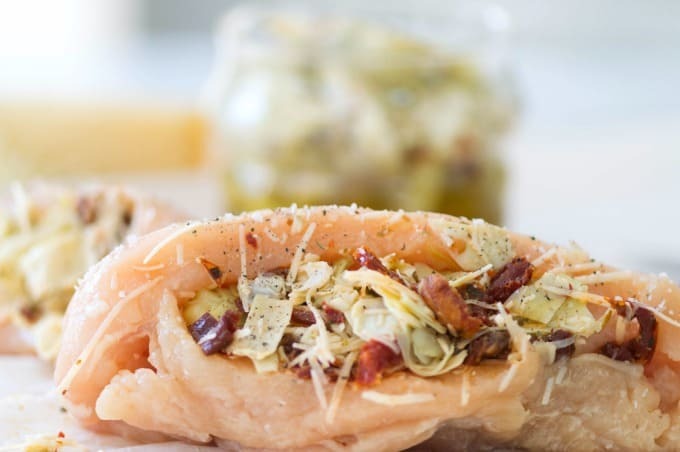 Tender chicken breasts are stuffed with sundried tomatoes, marinated artichoke hearts, and nutty Parmesan cheese in this easy recipe that's company-worthy. Preheat the oven to 400° F / 200° C / gas mark 6. 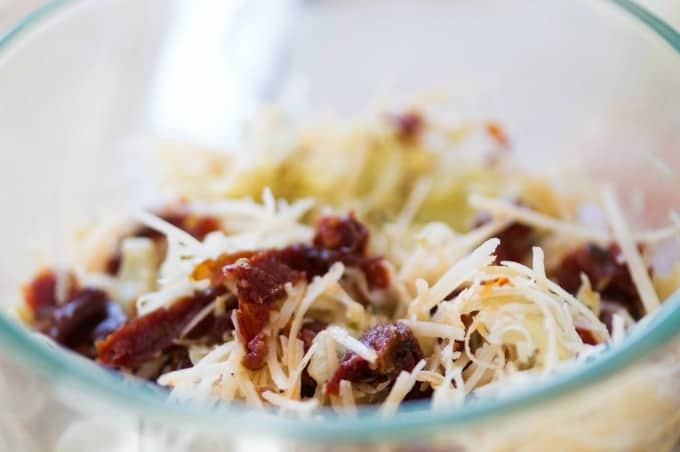 Combine the artichoke hearts, sun-dried tomatoes, and grated Parmesan in a small bowl. Cut a pocket in each chicken breast without cutting all the way through the back. Use your finger to widen the pocket. Divide the cheese mixture equally between the chicken breasts, using a spoon to stuff them. Use toothpicks to seal the seams well, overlapping the edges if possible. Season with salt and pepper on both sides. Heat an oven-safe skillet over medium heat. Add oil and brown the chicken on both sides. Transfer the skillet to the oven and bake for 20 minutes, or until golden brown and a thermometer inserted in the center reads 165°F / 74°C. Let the chicken rest for 5 minutes then remove toothpicks and serve. Make-ahead tip: Make the stuffing and stuff the chicken breasts ahead of time if you like. Just be sure to remove them from the refrigerator when you preheat the oven so they have a chance to reach room temperature. No oven-safe skillet? 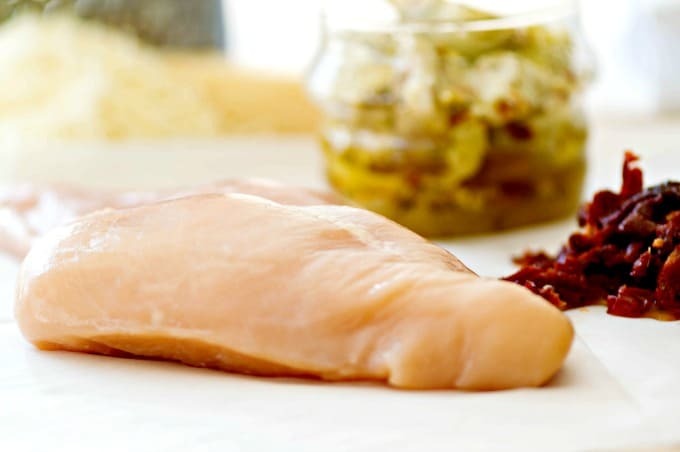 Transfer the browned chicken breasts to a lightly oiled baking dish and proceed with the recipe. I found this at the right time, I’m making out my grocery list. Thank you! Oh thank you for letting me know your results, Chelle! After you’d said on FB you were going to try it, I’d been waiting and waiting. I’m so glad you liked it! I love a good stuffed breast! Thanks for sharing! It is! Lately I’ve been adding Parmesan into the mix, too. So yummy! This looks so amazing, thank you for sharing this great recipe! It really is one of our family favorites! I have to confess, the last time I made it I kind of overcooked the chicken. (I blame the wine my sister-in-law and I were enjoying while I cooked.) Now I definitely recommend using a thermometer to catch it right when it’s done. Oh this looks amazing. I may have to try this recipe this weekend. I would love it if you would share this inspirational post at our WIW Linky Party. It’s still open. I hope you can join us. I’m so glad you liked them! What cheese did you use? I’m making this tomorrow to serve my sister- and mother-in-law when they arrive. It’s so easy to put it together in the morning then bake later. Come to think of it, I bet they could be put together and frozen for a future date. This prompted me to remove two chicken breasts from the freezer last night. I will probably use tomato pesto sauce, though, since I have no sun-dried tomatoes at hand. I bet tomato pesto would work, too. How did yours turn out? They turned out beautifully! I had to wing it with the cheese, too. Delighted to have this recipe… so easy and very delicious.